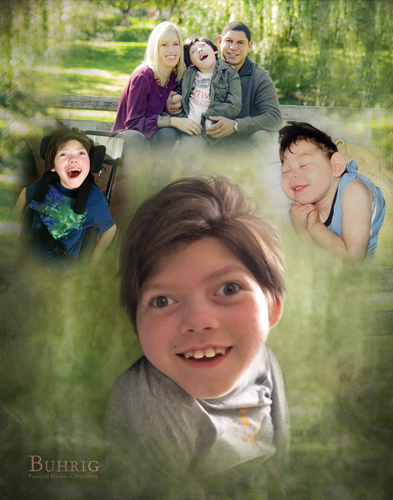 Logan Joshua Breed, age 13, of Mechanicsburg, was embraced by Jesus after spending a peaceful day with his loving family at home on Sunday, March 31, 2019. Logan was born on Tuesday, December 13, 2005 in Harrisburg to Lauren Elizabeth (Breed) Berrios. He is preceded in death by his grandfather, Pedro Berrios. Logan’s survivors include his mother and father, Lauren and Ty Berrios of Mechanicsburg; his grandparents: Marilyn and Roger Breed of Mechanicsburg and Esther and Carl Tizio of Camp Hill; and his faithful bulldog, Oliver. Logan was a boy through and through; he loved swimming and being outside. He enjoyed doing crafts, going on “walks”, and visiting the ocean where he could be in the water and put his toes in the sand. Logan was a big fan of Harry Potter and he enjoyed dressing up as the young wizard. Even though his vision was impaired, Logan found joys in many things around him. He got a kick out of hearing his buddy, Oliver, bark and absolutely loved being scared. Logan was also quite the football fan and he delighted in watching games with his parents. Even though they lived in a house divided, with Lauren being an Alabama Crimson Tide fan and Ty a Penn State Nittany Lions fan, the trio always had fun together. Some of Logan’s greatest memories were made when his parents and he came together as a family to cook. He helped to slow down life and give his family the opportunity to appreciate each other. Logan loved everyone and he brought them all so much joy. He will be remembered for his laugh, how happy he always was, and for having the biggest smile. All are welcome to join Logan’s family at his Celebration of the Life on Saturday, April 13, 2019, at 11:00 a.m. at Aldersgate United Methodist Church, 1480 Jerusalem Road, Mechanicsburg, PA 17050; with Pastor Jan Hughes officiating. Logan’s family invites everyone to join them for a time of greeting, food and fellowship at his church immediately following the service. Cremation was private. The family sends their most heartfelt thanks to Tara Deatrick, who was Logan’s nurse for over six years, and a special thank you to the late Ashley Krumrine who was Logan’s nurse for over eight years and who embraced Logan as he entered into Heaven. Contributions in celebration of Logan’s life can be made to the Special Olympics, 1133 19th Street NW, 12th Floor, Washington, DC 20036, www.SpecialOlympics.org/Donate or to the Tim Tebow Foundation, 2220 County Road 210 West, Suite 108, PMB 317, Jacksonville, FL 32259, www.TimTebowFoundation.org/Donate. Logan’s family has entrusted his care to Myers – Buhrig Funeral Home and Crematory in Mechanicsburg, (717) 766-3421. Read Logan’s full obituary, view his memorial video and portrait, and sign his official guest book at Buhrig.com.